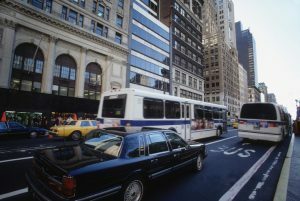 New York City, like many urban areas, is watching bus ridership numbers fall and buses themselves get slower. It’s a cycle: More transportation options mean people opt out of the bus for cars, which means more traffic, which means slower buses, which means more people opt out, and revenue drops right along with ridership. So the city is undertaking a concerted effort to get more people on buses and then get those buses moving faster again, and they’re taking an innovative first step to get there. Transit officials are going out of their way to ask bus riders–and some who’ve stopped riding–for their ideas to improve the system. And they’re getting some great answers. Read the whole story here.